Now, I’m not a huge fan of romance. My boss teases me every day that I should write historical romances and I hiss at her. But Anne and Teach had me HOOKED. I couldn’t eat. I couldn’t sleep. I couldn’t watch Mission Impossible with the rest of the fam. I don’t like swoony romances – this is not one. Anne is such a smart character; I loved that she didn’t fall head-over-heels in love and act like a love-sick ninny. I also don’t like quicky romances, you know – met you today, in bed an hour later = true love. Blackhearts is not one of those, either. I LOVED the slow, sweet way these two fell in love and I couldn’t wait to read more. I really, really, REALLY hope there is a sequel! I’m so excited that I recently had the opportunity to interview Patrick Jennings as part of the Egmont’s Last List blog hop. I also will be giving away one of Patrick’s books after the interview, so be sure to enter! I’m an elementary school librarian so Patrick Jennings, the author of Hissy Fitz, was at the top of my list. He has written so many books that I have in my library (and that I check out often to so many students!) I know Hissy Fitz will be a new favorite! Hissy Fitz released last month from Egmont USA. Here’s a little about it, taken from the Egmont website. Where did you get your inspiration for Hissy Fitz? During a writing workshop with about a hundred fifth graders in Bloomfield, Michigan. We were brainstorming a story about a cat when one student suggested it be insomniac. When I asked how it might overcome its sleeplessness, another student raised his hand. “It could go see a life coach.” Other suggestions were tai chi, hypnosis, and exercise. I chose the latter. I see that Hissy Fitz has his own Twitter account that is quite funny. Does he enjoy tweeting? Hissy tweets on the family laptop after they have all gone to sleep and he isn’t able to. I don’t know if he enjoys tweeting per se, but it does seem to give him a platform to vent his rancor, which rarely cools. Keeping the balance right. If Hissy became irredeemably nasty, no one would like him. But if I toned his nastiness down to the point that he was merely grouchy, he’s would lose the razor-sharp edge to his personality, which is what I think makes him distinctive. Would you consider yourself a cat person? I had cats for twenty years, but I was never an avowed cat person. I’m certainly not one of those crazy cat people. I never talked to my cats, or bought them clothing or jewels. I never subscribed to cat magazines. I never took a cat to a life coach. I ended up with a cat accidentally, and it worked out. Cats, like writers, are content to lounge around for hours during the day. What is your favorite part of your main character, Hissy? His self-possession. He knows who and what he is, what he needs and wants, and he doesn’t suffer fools lightly. Patrick Jennings’s books for young readers have received honors from Publishers Weekly, The Horn Book, Smithsonian Magazine, the PEN Center USA, the Woman’s National Book Association, and the Chicago and New York Public Libraries. The Seattle Public Library awarded his book, Guinea Dog, the Washington State Book Award of 2011. His book, Faith and the Electric Dogs, is currently being adapted for the screen. 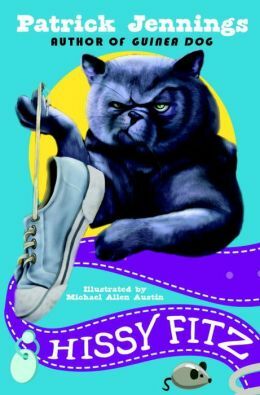 His new book, Hissy Fitz, was published in January 2015. 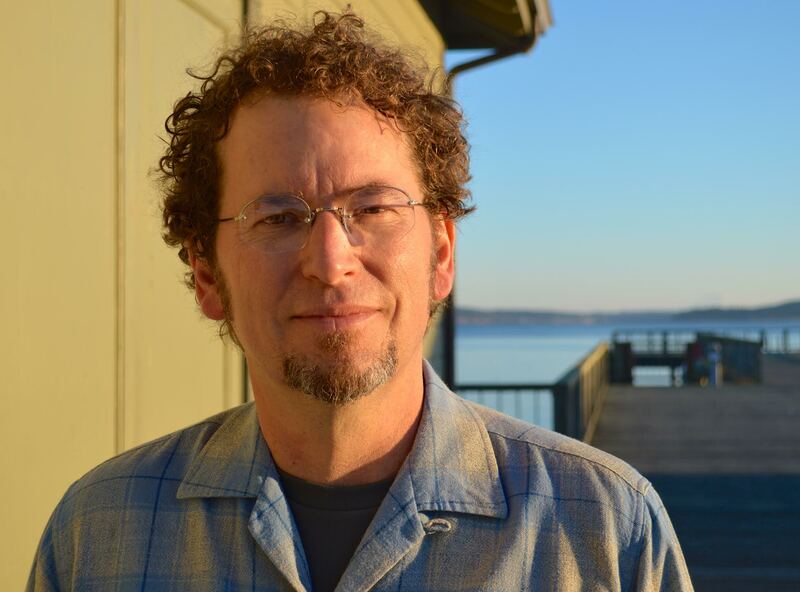 He currently writes full time in his home in Port Townsend, Washington. Patrick generously donated a copy of Odd, Weird & Little (North American entries only, please) for me to give away to a lucky winner. To enter please see the entry area below! It’s been a while, but I’m going to try to read (and review!) 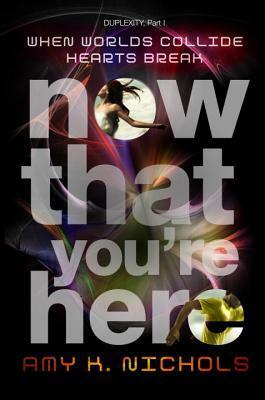 more books in 2015 – starting with NOW THAT YOU’RE HERE by Amy K. Nichols. It was so nice to have a book where the characters were smart and not superficial, and nice to have a YA book that didn’t try to push the envelope. I can already think of some of my science-loving students who are going to love reading this. Can’t wait for the next book, WHILE YOU WERE GONE coming out on August 4th! (I thought I loved this cover, but WHILE YOU WERE GONE’s cover makes me swoon with all kinds of colory-starbursty love. Check it out and pre-order it while you do! So far this winter hasn’t supported this fact, but Ohio winters can be brutal. It was on one of those blistering, blizzard-like days last year when I drove my kids to school early in the morning. As we do each and every morning, we passed a bus stop which in our city is a pole with a picture of a bus on it. Standing there was a woman, bundled up, with a sad-looking stroller and a bundled up baby inside. Waiting for the bus with nothing to cover them, or shelter them from the nasty elements. For me, it was heartbreaking. I always want to help people out as I drive by, by giving them a ride, but this day and age – can you safely do that? I told myself ‘no’ and kept driving. It was then that it hit me that I was so removed from anyone less fortunate. I have a relatively new car — new enough that it doesn’t break down on me when I try to go somewhere. I usually have a full tank of gas and when I run out, I just stop at the gas station to buy more. I’ve never had to ride a bus or depend on someone else for a ride. I have a warm house to go home to. And on that day I realized — I took everything I have for granted. Yes, I’ve donated to charities in the past. It’s so easy to give someone a check or throw money or canned food into a collection basket or a red bucket. But that still keeps me removed from the real problem. I don’t see these people that are struggling, I just have faith that my donation will help someone, somewhere. But how can I really, truly help with a problem if I never see it face-to-face? I was done being removed. But where could I start? My answer showed up in our church bulletin a few weeks later. One of the local food pantries was going to open for extra hours in the afternoon because they had so many people to serve and needed more help. I was so nervous on my first day. I carefully planned what to wear. I have to dress up for work but didn’t want to go dressed up in my fancy work clothes since I was going straight from work, so I packed jeans and tennis shoes. I will never forget watching Ellen this summer and seeing Fergie sitting there as a guest, telling all of the TV audience to give to a certain charity (I don’t remember which) — but what I do remember is that she had so much sparkling jewelry on that it was distracting. So much that I was put off by her appeal. Who goes on television dripping with expensive jewels and tells other people they should donate money? Couldn’t she donate one of those rings? Or her necklace? Don’t get me wrong – it was great that she was giving light to the topic, but being a little more humble while doing it would go a long way. I was not going to be a Fergie. Once I got there, my fears were put to rest immediately. The ladies who were volunteering that afternoon were so nice and put me right to work — I didn’t have time to be nervous. They showed me how to help people shop for food, how many of each item each person could get, and everything I’d need to know. I felt horrible when I was helping one lady and told her it was my first day. I said “You probably know this stuff better than I do!” UGH! I didn’t mean to imply that she had been there more than once and I felt horrible that those words came out of my mouth and sounded like that’s what I meant. Luckily she was nice, smiled, and kept looking for her food. I beat myself up for a week after that one. But besides that, the first day went great and I felt so much better when I left. Not better physically, but my heart felt better. Bigger. That was a few months ago. I’ve been back to volunteer almost every week since then (minus a few weeks when I was too sick to get there). Tuesday afternoons have since become my favorite time of the week. We hear so much about “entitled” people from critics hiding in their homes, behind their keyboards but I’ve seen so little of that. Most of the people I’ve helped have been genuinely grateful and not only that, happy. They’re not embarrassed, they don’t let pride get in their way, and are grateful for what they do have. I’ve learned so much from them. I’ve seen grown men cry. I’ve seen the volunteers chip in for cab fair for a man who came on the bus, could barely breathe or walk, not knowing there wouldn’t be a return bus to pick him up for another two hours. I’ve held sweet babies who need food and diapers and I’ve helped people fill out their paperwork who have hands too crippled to write. Last week we had a donation of boxes and boxes of brand new children’s winter coats. Anyone who came in and had children left with not only food, but a warm coat for each of them. It does wonders for your heart. I am no longer removed and it has made me a different person. I no longer take anything for granted. I’m not posting photos of the gifts under our tree on Facebook this year (nor will I again) because I’ve seen far too many people who have nothing to give and nothing to receive. Don’t spend another day taking your blessings for granted. We all have them. You just need to know where to look and not take what you have for granted. And this Christmas, or even for 2015, figure out a way to be the change. I promise it will also change you — in the best way possible. I recently attended a great class presented by Jodi Casella at the Northern Ohio SCBWI Conference about organizing your book after you’ve written it. 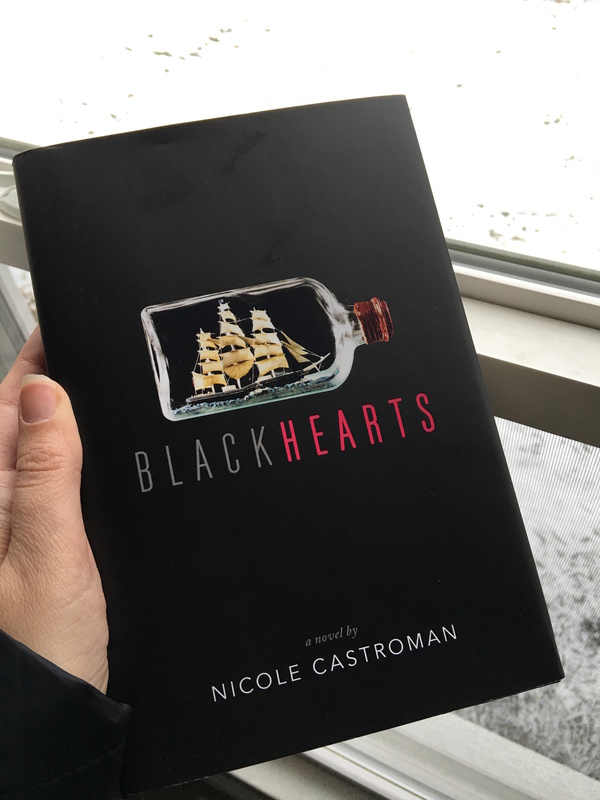 She shared so many amazing ways that authors use to keep their books straight so I thought I’d share mine with you. When I started writing my first book four years ago I was a pantser. And I was so proud of it! That book didn’t get me far. Great concept, great hook, big hot mess. So for the next book I bent on my pantser ways just a little and was more organized when I wrote it. But still not enough. And it took me forever. Over a year ago I mentioned an idea for a new middle-grade novel to my agent and when he emailed back to tell me he loved the idea, he mentioned that he’d love to take a look at my outline. Oh, good lord. My what? For a brief moment I thought of telling him, “I don’t do those kinds of things”. But I didn’t. Instead I sat down and actually wrote a chapter outline for the whole book. Then I had my foot surgery and life became one big hot mess so the outline and the book idea faded into the depths of my hard drive. Until I dug it back out this March. 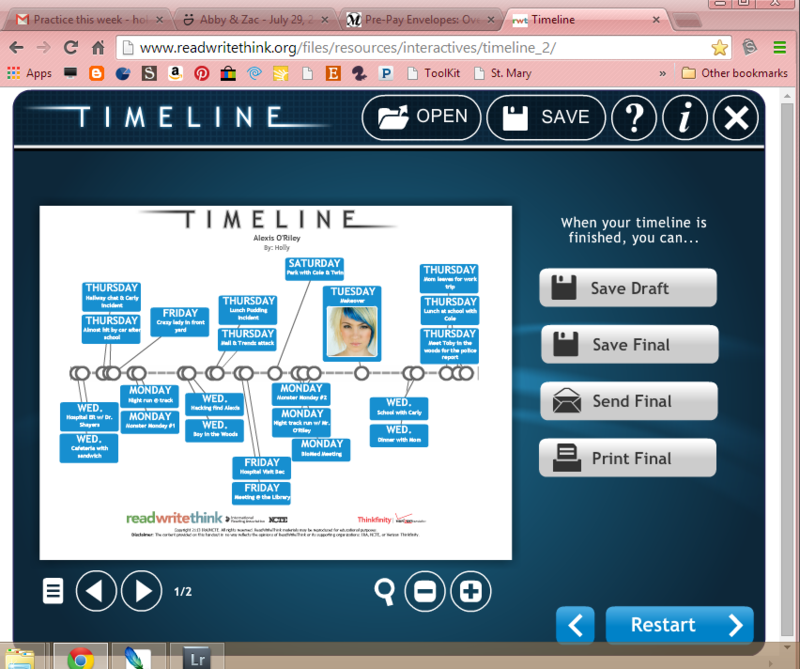 And I followed that outline as I drafted. Not exactly, but there was enough there that it helped me draft the book in a little over a month. It was liberating! I will never write without one again. But when the book was finished I worried that my rough outline didn’t keep the scenes, days and details straight enough. Lucky for me I happened to see a post on Twitter by the talented Kat Zhang with a link to the Timeline feature on ReadWriteThink.org and it blew. my. mind. Seriously. 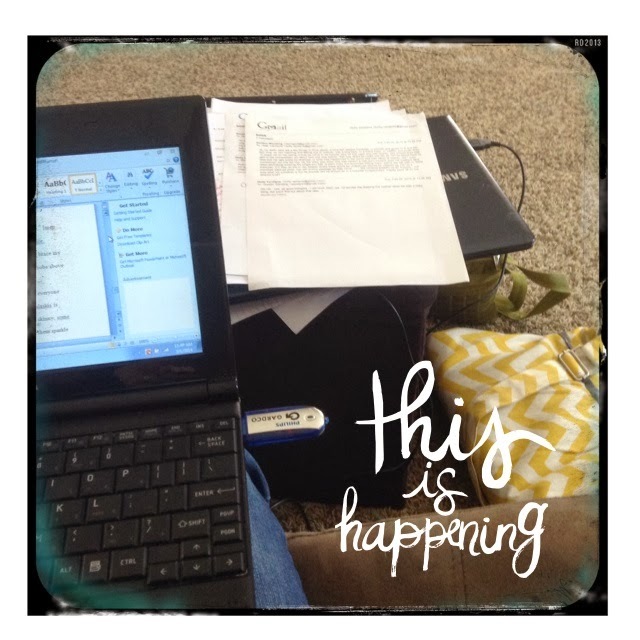 You organize your points however you want and when you’re done, you save it to your computer. Then when you want to open it up again, just pull that file back up through the website and move things around. It even lets you upload photos. This –> is the first half of my book. I organized my timeline by day (so I knew if I had my MC going to school on a Sunday) and ended up doing it in two halves with two different files because the book spanned a period of three weeks. My book was suddenly organized! And for it being free software, you really can’t beat it. I’m writing this post from a hotel in Cleveland. I woke up at 5:15 and haven’t been able to go back to sleep. Sure, one of the reasons is probably that the bed is too soft (seriously – since when would that be a problem?) but the other bigger problem is the huge info dump my brain is trying to process after this weekend. I’m here because I attended the Northern Ohio SCBWI Conference and there was so much good/useful/fantastic information thrown at me that I think my brain is refusing to shut down until it goes over (and over!) every single detail. Doesn’t help with the whole sleep issue. These conferences are so valuable. It’s an opportunity to improve your craft. It’s an opportunity to network. It’s an opportunity to get renewed, refreshed, and re-energized to do what you do best. If you ever get a chance to go to one – take that chance. You won’t regret it. Hanging out with notes from my beta readers. I’m a dreamer when I write. Things don’t always make sense, and they’re not always possible. My readers are really good at grounding me and bringing me back down to earth. In fact I got a call at work from my husband this past week where he started the conversation with “Are you crazy? Do you think submarines are made out of fruit roll-ups?” ha ha ha – well, they’d be pretty yummy if they were, wouldn’t they? I’m diving back into sorting through my reader notes. Each one makes this story so much better and that makes Holly a happy girl. Today my new middle grade novel went out to beta readers. On one hand, it’s a huge relief. It’s out of my hands. On the other hand, other people are reading it and that’s scary. They may not “get” it. They may hate it. I hope they love it as much as I do. Wow. That was a long road. I knew recovery would take a while but I never imagined it would take 4 months. I also assumed my recovery would be purely physical. Sometimes I think the mental recovery was worse. But the good news is, I finally feel like I’m back. I haven’t had to take a pill for a week (not even an Advil!) and while I have a few little tweaks of pain here and there, it’s nothing that I can’t handle. And since there is no more pain when I walk, I walk better. I’m still a little slow because I’m still figuring out how to walk the right way, but that’s OK. I’ll get faster. Until then, feel free to enjoy a leisurely stroll with me while we chat. The best part is that I’ve started writing again. I wrote some when I was laid up on the couch this summer, but I can’t write on a couch. I’m a sit-at-a-desk-while-I-write kind of girl which was hard to do with a huge cast covering my leg. I got into a not-writing funk. I floundered on what to work on, flip-flopping to a different project every week, frustrated that the words weren’t flowing like they used to. Writing makes me happy, so without that I felt lost. I needed something to get me back on track. 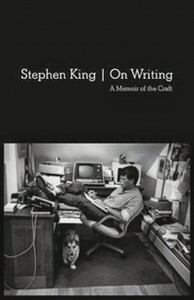 First, I read Stephen King’s On Writing. Hands down the best thing I could have read. I’m a huge SK fan so I’m kind of shocked I hadn’t read it before this, but he’s just the right person to give you a swift kick in the pants to make you put your fingers to the keys. (And make you laugh while you’re doing it) I’m sure the other parents in the school pickup line were wondering what I was on as I laughed uncontrollably behind the wheel. This sentence from the book was exactly what I needed. At the start of the road back I just tried to believe the people who said that things would get better if I gave time to do so. Another huge part in getting out of my funk was going to the Northern Ohio SCBWI (Society of Children Book Writers and Illustrators) conference in Cleveland last weekend (will try to post a re-cap sometime this week). If you ever need to be inspired, sign up for an SCBWI Conference. I’m lucky to have one so closely available to me and it did the trick. And now I’m signing off to write.